Hey man Don't double post its spam(not the kind you eat ) Hit the edit button on the end of you screen, its at the corner of every on of your post. I think this is close to a keeper! i used the font i used insted of the starwars font because ive always seen boba as being hightech and this font is more hightech. 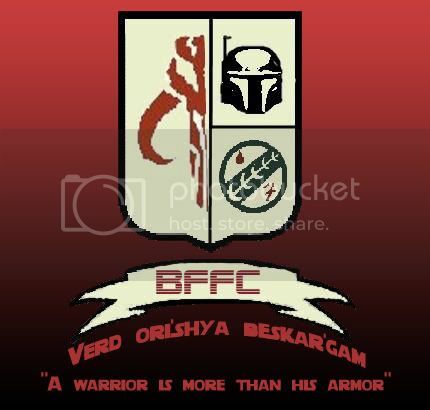 NEW EDIT i added black to the backround and added a mandalorian proverb. this could be final by my standards. Sweet! this is what I'd talking about! Working together to make something awesome. UnluckyFett how would you like to join BFFC's AMM: http://www.bobafett.com/boards/viewtopic.php?id=2357 ? yea that would be great how do i join? I'll add you to the list of team members and pm you when we get a project or you can pm the other members if you wish to start a project. Perhaps we don't need the basic (or english) translation in the real version. I think the Mando'a does just fine on its own. Like there isn't english AND latin on the dollar. Hears a new one with bobas helmat insted of the english. but personally i like the last version with the english but im tring to comprimise. I agree. The Mando'a-English banner suited me better. Although I'd prefer it to be just in Mando'a. Those who know what it means, are just fine. Those who don't will get shot. Darn, I'll work on it, see what comes up. Ok this one has 2 sayings. the new one means Truth, Honor, and Vision. I like I'll wait and see what Alo comes up with, but this last one here is Great! We already HAVE a coat of arms!!! We dont need a BFFC coat of Arms. but I do not think it hurts my honor in any way. Lot of groups have a cote of arms car companies,sports companies, law firms, and so on. I don't see why we should not make a cote of arms, or how it in any way is disrespectful to you or your ancestors. i like the mando'a motto because it is very symbolic. its like "e plubius unium" on the doller bill. i still haven't learned how to put the fade in with photoshop so any one that could help please do so. Do you know where the "Layer" window is (?) go there and select the font layer, then click "type" scroll around and find the one you like best. The only thing that I am not sure about it is the Mythosaur skull. I think it would look better if it was centred and whole. Is it possible to change the font? 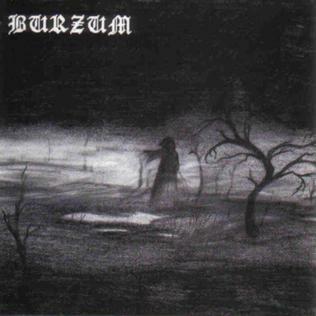 If you can, I'd suggest using something like the one in this image: http://upload.wikimedia.org/wikipedia/e … Burzum.jpg . Thats just a suggestion, of course. Wow, I've never seen draco use an exclamation point before, so I guess this isnt all that bad. I mean, just for fun or whatever........its fine I guess. I have my family coat of arms/seal on the wall next to the computer.........the famous BONANNO crime family! Thats a great idea about the backround!! But I was thinking a little smaller, maybe like an icon or something on the banner of BFFC??? 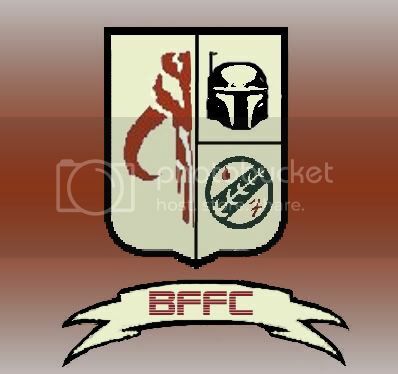 If were talking backrounds, I'd LOVE for this site to have someething like a Boba fett myspace layout! But thats a wholenother story. Good thinking! We need Admin to decide if we can have a coat of arms. And I think you guys need to look a5t the link I provided. Like this one the best--the two sayings are great, and I like the image. And the idea of a banner, but its Aaron's choice. Its on the first page.